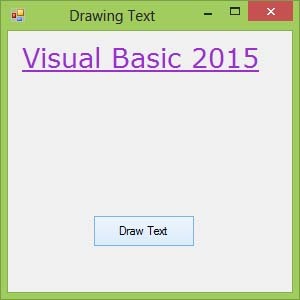 We have learned how to draw rectangle, ellipse, and circle in visual basic 2015 in the preceding Lessons, now we shall learn how to draw text on the screen. Yes, instead of using the Print command, you can also draw text on the screen. Where the first argument of the font is the font typeface, and the second argument is the font size. You can add a third argument as font style, either bold, italic, underline.